This article is about the sufi order. For the Ba'Alawi family, see Ba'Alawi sadah. Not to be confused with Alawiyya or Alevism. The Ba'Alawi tariqa (Arabic: طريقة آل باعلوي‎‎), also known as the Tariqa Alawiyya is a Sufi order centered in Hadhramawt, Yemen, but now spread across the Indian Ocean rim along with the Hadhrami diaspora. The order is closely tied to the Ba'Alawi sadah family. It was founded by al-Faqih Muqaddam As-Sayyid Muhammad bin Ali Ba'Alawi al-Husaini, who died in the year 653 AH (1232 CE). He received his ijazah from Abu Madyan in Morocco via two of his students. 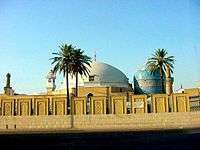 Abu Madyan was a student of Abdul Qadir Jilani, as well as one of the shaikhs in the Shadhiliya tariqa chain of spiritual transmitters from Muhammad. The members of this Sufi way are mainly sayyids whose ancestors hail from the valley of Hadramaut, in the southern part of Yemen, although it is not limited to them. The chain of ijazah of spiritual Sufi transmission from al-Faqih Muqaddam Sayyid Muhammad traces back to the Islamic prophet Muhammad via his cousin Ali and from him, his son Husain. The name Ba'Alawi itself is a Hadhrami contraction of the terms Bani 'Alawi or the Clan of 'Alawi. In the early 4th Century Hijri at 318 H, Sayyid Ahmad al-Muhaajir bin Isa ar-Rumi bin Muhammad al-Naqib bin Ali al-Uraidhi ibn Ja'far al-Sadiq migrated from Basrah, Iraq first to Mecca and Medina, and then to Hadhramout, to avoid the chaos then prevalent in the Abbassid Caliphate, where descendants of Muhammad were continuously being suspected of arson and revolt against the caliph. Most descendants of Muhammad known as sayyids enjoyed much followings due to their steep knowledge in Islam and its teachings, both esoteric and exoteric. Although such personalities may not have political ambitions, having huge followings means that they always attract the suspicions of the caliphate. The name 'Alawi refers to the grandson of Sayyid Ahmad al-Muhajir, who was the first descendant of Husain, Muhammad's grandson, to be born in Hadramaut and the first to bear such a name. Thus all the 'Alawi sayyids of Hadramaut are his progeny, and his descendants has since spread far and wide to the Arabian Peninsula, India especially in northern states of Surat and Ahmadebad and along the Malabar Coasts, North and West Coast of Africa, India, and the countries of the Malay Archipelago spreading Sunni Islam of the Shafii school and the Ba'Alawi Tariqah brand of Sufism. Ba 'Alawiyya Sufi order, according to historians, is linked to Madyaniyya Sufi order. It is also influenced by Qadiriyya, all because the founder, Muhammad al-Faqih al-Muqaddam received the spiritual tranmissions from them. Hadhramaut during his life was torn by constant tribal fights. al-Muqaddam advised the descendants of the Sayyid to abandon arms and wars and instead to pursue religious and moral values. As the founding father of the Sufism in Hadhramaut, he received the title of the Qutb al-Irshad wa Ghausil al-'Ibad Wa al-Bilad (Arabic: قطب الارشاد وغوث العباد والبلاد‎‎) of the Ba 'Alawiyya Sufi order, which is the highest rank in Sufism (see also Abdal). Initially, the followers of Ba 'Alawiyya functioned secretly for about five centuries. Like many other Sufi orders, Ba 'Alawi order supports the doctrine of outward (zahir) and inward (batin). The outward aspect of this tariqa consists of pursuing religious sciences and ritual practices while its inward aspect is the attainment of Sufi stations (maqamat) and states (ahwal). The virtues of the order is that its adherents never disclose their secrets (sawn al-asrar) and they preserve them from uninitiated. The outward aspect follows Al-Ghazali's practices as described in his Ihya Ulum al-Deen, while the inward aspect is similar to Shadiliyya Sufi order. The basic doctrine of Ba 'Alawiyya is the purification of heart through saintly life. Even Though it is a Sufism and an offshoot of Qadiriyya, but it does not have Khalwah (seclusion for purposes of spiritual exercise) and does not renounce worldly activities. It also emphasizes the teaching and practicing Akhlaq as exemplified by the Prophet Muhammad. Imam Ahmad bin Isa al-Muhajir and his son, according to majority of historians, spread the legal school of Shafi'i and Ash'ari for theology. A few historians had pointed out that Ba 'Alawis incline to Shiism because many of the Shiites had followed some of the order of Ba Alawis in certain regions In fact, some of the practices done in Ba'Alawiyya are similar to Shiah's practices, such as Ziyarat or building Shrines. R.B. Serjeant summarizes the main points of Ba 'Alawiyya tariqa: The Sayyids affirm it is the best Tariqa based on al-Qur'an and Sunnah and the beliefs of pious ancestors (al-Aslaf Shalihin), but act with humility, piety and lofty motive. The follower must love obscurity, dislike manifestation, withdraw from madding crowd, but he still has to warn and advice in matters of religious duty. He must also show kindness to his family, relatives, neighbors, friends, acquaintances, tribes and to all other Muslims. The tradition was transmitted orally in its first generation, so no books were written. Later on, transmission through writing became more important to clarify some obscurity. Books such as al-Burqa, al-Ma'arij, al-Kibrit al-Ahmar, al-Juz al-Latif were then written to preserve the gradual disappearance of the tariqa. The tariqa also teaches the adherents to give da'wah and disseminate Islam peacefully without violence. This explains why Islam could have spread easily in South East Asian countries and was accepted by the indigenous people, where the followers brought Islam peacefully and mostly through trading and marriage (this because the men did not bring their wives abroad). Ba 'Alawiyya followers also practice other outward-aspect traditions not taught in Ihya Ulum al-Deen. For example, it is common for the Ba 'Alawiyya followers, especially in Hadhramaut and Indonesia in the past, to perform Taqbil, especially to respected Habibs. Annual spiritual activities such as Mawlid, Khaul (anniversary commemoration of the death of a family member or to highly respected persons in the community), or practices performed routinely such as Majlis Dhikr (Dhikr assemblies, usually by reciting dhikr or wirid such as Wird al-Latif or Ratib by Habib Abdullah bin Alwi al-Haddad after every Fajr and Maghrib time), Tahlil (another form of Dhikr assembly, but usually is performed if somebody dies), Reading of classical Islamic books, and Ziyarat are practices followed by Ba 'Alawiyya. During these events it is not uncommon to see Haḍras and Qasidas also recited and sometimes accompanied with Rebanas. Some of the above practices (such as mawlid or qasida) even performed in a wedding ceremony. The influences of Ba 'Alawi tariqa can be found also in a few large Islamic organizations. For example, the rituals performed by members of Nahdlatul Ulama such as Tahlil, mawlid or ziyarat are all influenced by and can be traced back to the Ba 'Alawiyya teachings, where Hadhrami of Ba 'Alawiyya migrated and taught the tariqa in Java since 18th centuries. In Hadhramaut, the teaching of this tariqa is done in several Ribath, such as Ribath Tarim or at Dar al-Mustafa founded by Habib Umar bin Hafiz. 1 2 3 4 5 6 Ali Aziz, Muhammad (2011). Religion and Mysticism in Early Islam: Theology and Sufism in Yemen. 26. I.B.Tauris. p. 296. ISBN 978-0-85771-960-7. Retrieved August 28, 2014. ↑ "Qutbanniyya". Retrieved September 11, 2014. ↑ Fathimah Handayani, Luthfi (2012). "Kebertahanan Organisasi Islam berideologi Tasawuf" (thesis) (in Indonesian). Universitas Indonesia. Retrieved September 11, 2014. ↑ Awliya. Retrieved September 11, 2014. 1 2 Schwartz, Stephen (2008). The Other Islam: Sufism and the Road to Global Harmony (unabridged ed.). Crown Publishing Group. p. 224. ISBN 978-0-385-52665-4. 1 2 3 Raṇṭattāṇi, Husain (2007). Mappila Muslims: A Study on Society and Anti Colonial Struggles. Other Books. ISBN 978-81-903887-8-8. Retrieved August 28, 2014. ↑ Freitag, Ulrike; Clarence-Smith, William G., eds. (1997). Hadhrami Traders, Scholars and Statesmen in the Indian Ocean, 1750s to 1960s. Volume 57 of Social, economic, and political studies of the Middle East and Asia (illustrated ed.). BRILL. p. 392. ISBN 978-90-04-10771-7. ↑ Azyumardi Azra; Wayne Hudson, eds. (2008). Islam Beyond Conflict: Indonesian Islam and Western Political Theory Law, ethics and governance. Ashgate Publishing, Ltd. p. 237. ISBN 978-0-7546-7092-6. Retrieved August 29, 2014. ↑ Abdillah, Aam (1998). Tradisi pembacaan ratibul Haddad di Bekasi: laporan penelitian (in Indonesian). Bandung: Pusat Penelitian, IAIN Sunan Gunung Djati. p. 56. Retrieved August 29, 2014. ↑ "Tradisi Khatam Bukhari" (in Indonesian). Retrieved August 29, 2014. 1 2 Turmudi, Endang (2006). Struggling for the Umma: Changing Leadership Roles of Kiai in Jombang, East Java. Islam in Southeast Asia Series. ANU E Press. p. 214. ISBN 978-1-920942-43-4. Retrieved August 24, 2014. ↑ Boxberger, Linda (2002). On the Edge of Empire: Hadhramawt, Emigration, and the Indian Ocean, 1880s-1930s (illustrated ed.). SUNY Press. p. 292. ISBN 978-0-7914-5218-9. Habib Dr. Mohd Hisham AlJufri. Understanding Tariqah Ba'alawi. Retrieved August 28, 2014. Habib Zayn bin Sumaith. "al-Manhaj al-Sawii Sharh Usul al-Tariqah al-Saadah Aal Baalawi" (PDF) (in Arabic). Archived from the original (PDF) on September 3, 2014. Retrieved August 28, 2014. D. van der Meulen; Hermann von Wissmann (1932). Ḥaḍramaut: Some of Its Mysteries Unveiled. 9. Translated by Mary Barber. Brill Archive. p. 248.